To do justice to this wonderful neighborhood we have published a book that highlights the neighborhood’s history, architecture, and the unique people who have lived here over the years. We regret that the Cadwalader Heights book is out of stock at this time. Another neighbor, a professor at Rider University, has explored the philosophy underlying Frederick Law Olmsted's design style - Elegance and Grass Roots: The Neglected Philosophy of Frederick Law Olmsted. Around 1738, Dr. Thomas Cadwalader, a prominent and wealthy Philadelphia physician, moved to Trenton and was elected as the city’s first mayor in 1746. Cadwalader moved back to Philadelphia in 1750, but while in Trenton he and his wife Hannah had a son, Lambert Cadwalader. Lambert Cadwalader, a Lieutenant Colonel in the Continental Army, was taken as a prisoner of war during the November 1776 Battle of Fort Washington in upper Manhattan. After General George Washington personally arranged for his release, Cadwalader removed to his Trenton estate, which he had purchased in February 1776. Cadwalader’s 240-acre estate included the homestead that he named “Greenwood." Cadwalader was a New Jersey delegate to the Continental Congress (1784-87) and served two terms in the House of Representatives (1789-91; 1793-95) when the nation’s capital was in Philadelphia. After Cadwalader’s death 1823, his son, Thomas Cadwalader, inherited the estate. Thomas Cadwalader was a lifetime military man, who lived both at Greenwood and the family townhouse in Philadelphia. After his passing in 1873, his lawyer sons, John L. Cadwalader of New York City and Richard M. Cadwalader of Philadelphia, inherited and managed the family estate. Recognizing Trenton’s westward expansion and imminent residential development, the Cadwaladers engaged the services of Edmund C. Hill to market and develop their property. Hill, who was born into a working-class family and entered his father’s bakery business, became Trenton’s leading civic booster. 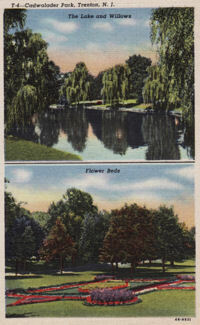 In 1888, he championed the creation of Cadwalader Park, the land of which the city purchased from the Farlee estate. From 1890 to 1892, Frederick Law Olmsted himself supervised the park’s development. Olmsted, the nation’s foremost landscape architect, was responsible for the design of many of America's most famous parks and gardens, including Central Park and the National Mall in Washington, DC. Cadwalader Park has the distinction of being the only park in New Jersey designed by Olmsted. For Cadwalader Park, Olmsted prepared plans for pedestrian paths, carriage drives, the location and type of vegetation and trees, and lawns and groves surrounding the Ellarslie mansion located in the heart of the park. Ellarslie, an Italianate villa designed by noted architect John Notman, was built in 1848 as the summer residence for Henry McCall, Sr. of Philadelphia. Over its 160 history, Ellarslie has been a restaurant, ice cream parlor, and even a monkey house. In 1971 it was renovated to become the Trenton City Museum, and in 1972 and 1973, respectively, it was listed on the New Jersey and National Registers of Historic Places. Ellarslie will be open to the public during the house tour, and will offer an exhibit on the history of this classic American neighborhood. Meanwhile, Hill and Olmsted laid out a part of the Cadwalader estate near the river as Cadwalader Place, now known as Berkeley Square. Olmsted also prepared plans for the “Cadwalader Woodland,” a steep and rugged 31-acre tract adjacent to the park that would become Cadwalader Heights. Olmsted’s original design for this new, exclusive neighborhood was essentially carried out to his original vision by his successor firm - Olmsted Brothers Landscape Architects. Hill filed plans for the neighborhood in 1907, and that same year Frank Forrest Frederick, Director of the School of Industrial Arts, built the neighborhood’s first house at 9 Belmont Circle. Many of Trenton’s industrial elite would soon follow. Magnates of the city’s thriving pottery industry were well-represented: William Tams (Greenwood Pottery), Matthew Scammell (Scammell China), Mark Solon (Mercer Pottery), and Paul Duryea (Cook Pottery). Other prominent residents included local builders Howard Heath (Heath Lumber) and John G. Connor (Connor Millwork), as well as William Wetzel, Principal of Trenton High School, and the candy maker William Allfather. Respected architects who designed many neighborhood homes included J. Osborne Hunt, Willam Endebrock, J. Phelps Pette, and William Klemann, who also built a house for himself here. By 1932 the Cadwalader Heights neighborhood of approximately 75 homes had achieved its present form. Today, this well-preserved neighborhood, with its rich variety of architectural styles and tree-lined streets, evokes the grandeur of the city’s illustrious past.